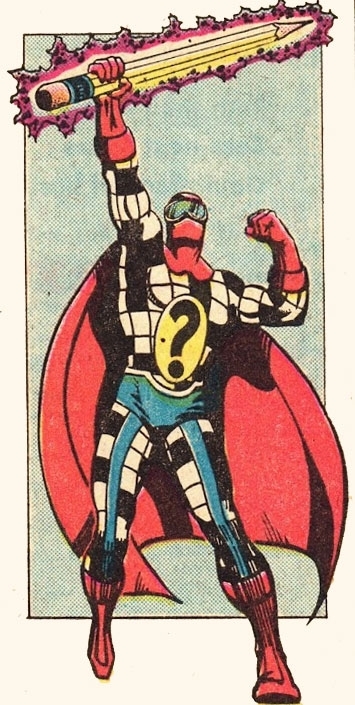 In the 1980s, Marvel Comics published a comic that was entirely filled with puzzle and games for younger readers. It was appropriately titled Fun And Games. There would be mazes, puzzles, word searches, pretty much all of the things your parents now do after they retire. Kids developing their cognitive skills also get a thrill out of these, as I’m discovering again with my youngest daughter. Fun And Games ran for thirteen issues from 1979-1980. Before it ceased publishing, there was a small contest announced to design a mascot for the comic. I presume the character would be used in that corner box almost every marvel comic book had during this period. The covers of Fun And Games lacked this, because after all, what would be there? As an interesting postscript, John Schlim went on to create comic books! He’s a writer, and founder of Ovation Comics. He’s successfully funded four comics on Kickstarter, including Goth Ghost Girl, Masque, and most recently, Infinity Agents. He even offers a free 16 page preview of his comic Salamandra, which is pretty good. To get the preview, just sign up for his newsletter. This is not the last time we’re going to talk about John Schlim Jr. Tags: Fun and Games, John Schlim Jr.